A Catch Up Involving No Ketchup! A. I’m so behind! I have so so so many recipes to share. So in order to catch up, I’m strictly going to post recipe after recipe for a bit, no fluffy commentary. But don’t you worry! Fluffy commentary will be back. B. I have nothing against ketchup, I quite like it actually. I’m just currently stuck on mustard. It’s 0 points and super yummy! Currently in my fridge you can find 5 different kinds! 1. Regular Yellow Mustard 2. Spicy Brown Mustard 3. Southwest Mustard 4. Honey Mustard 5. Dijonaise Mustard. Okay, down to business! I’m gonna post a few of my new favorite things here that have become staples for me! I’ll try to group recipes in categories for the next few posts so it’s not a huge overload in one post. My new favorite way to make Iced Coffee: http://www.nytimes.com/2007/06/27/dining/276drex.html?_r=1! It keeps longer because it’s cold brewed and it’s sooo worth the effort (which isn’t much). I made a double batch and let it cold brew in a mason jar. I set my strainer over a bowl and lined it with two coffee filters. Strain once, rinse out jar, rinse out the strainer, pour bowl coffee back into jar, set up strainer with two more coffee filters, and strain again. I pour it right back in the jar and kept it that way. To sweeten mine I’m a BIG fan of Splenda sweetened coffee syrups. I plan to collect them all, but only have the sugar free caramel right now. I also tried coffee ice cubes! Take 1 part cold brewed coffee concentrate and 1 part water and freeze in ice trays! No more watered down coffee. I made my favorite pot roast recipe found in a previous post again this week. It never fails to be amazing! And good news for Weight Watchers, the only points you count are for the roast! I used some left over roast to make a super yummy roast beef sandwich! Toasted the bread, spread some spicy brown mustard, piled on 4 oz of roast beef, topped with green onions and a little blue cheese. I dipped it in some of the left over juice. So good! Spiced Carrots! My new favorite side. Carrots are, of course, 0 points on Weight Watchers. I used to love making “candied” carrots with brown sugar and cinnamon and butter. Well now… I make a just as yummy substitute! I have used frozen crinkle carrots and fresh baby carrots, both work well. I just put the carrots in a pan with some water, not enough to cover them completely, cover them about half way. Then I spray about 20 sprays of Parkay 0 Calorie butter spray. When they start to cooked down I liberally sprinkle cinnamon, nutmeg, black pepper, and a few packets of Splenda on them. The perfect side to any meal and 0 points! My other favorite side that is a staple, particularly when I cook for my RAs (they always request them!) is Italian Green beans. I buy the steam in the bag whole green beans and cook them per package instructions in the microwave. Once finished, I put them in a heated pan and pour fat free Italian dressing all over them. For 1 bag I’d use about 1/4 of the bottle. Cook them for a bit until the dressing starts to bubble and the liquid decreases. Very flavorful and about 1 point per serving. 1. Brummel and Brown Natural Yogurt Spread. It’s only 1 point per tbsp! I sat in the grocery store and measured all the different ones. It’s definitely the lowest and really yummy! Great to substitute for butter or margarine in recipes. 2. Fat Free Cool Whip: Walmart does not have a generic brand but Kroger does! 3. Strawberries with melted semi sweet chocolate chips. Such a satisfying dessert fix! Strawberries are 0 points and 1 tbsp of chocolate chips are 2 points. 4. Cottage Cheese: Okay, so I THOUGHT I didn’t like cottage cheese, but decided to give it another try. I LOVE IT! I love it with pears and peaches, BUT I love it in savory ways too. I love it on my salads! 1/4 cup of fat free cottage cheese is just 1 point. I’ve also tried it on baked potatoes, which is also super yummy! Cheap and you get in one of your dairy servings for the day. 5. Sugar free pudding and jello: I always keep a made up batch of sugar free pudding of some flavor and sugar free jello mixed with no sugar added can fruit in my fridge. The sugar free pudding is just 2 points per serving. I also often make them into a mousse if it’s the right flavor. The sugar free lemon makes a yummy mousse mixed with fat free cool whip. They have so many flavors! Pistachio, lemon, vanialla, french vanilla, chocolate, cheesecake, etc! Sugar free jello is 0 points! The fruit is 0 also. I like to add fruit because it stretches it and makes it more exciting. My favorite combos are orange jello with pineapples, lime jello with fruit cocktail, and strawberry jello with peaches. 6. Mandolin: Okay, not a food item, but a life saver! I discovered that if I wash, slice, and store all of my produce when I get it home from the store, it lasts longer! I don’t know if it actually lasts longer or if I just eat it quicker, but whatever the case, it works! Makes preparing a salad or packing a lunch so quick and easy. Last weeks selections were green onions, cantaloupe, apples, strawberries, and cucumbers. Also had grape tomatoes washed and read in the fridge. 7. Good tupperware: Again, not food, but vital! It makes storing your produce fun, keeps everything fresh, and makes for easy portion controlled lunches and snacks. I discovered a secret to making the BIG cheaper bag of lettuce from Sam’s last longer. Buy it it’s own big tupperware. Wet and wring out paper towels to line the tupperware with, place lettuce in tupperware, cover with more damp paper towels. My super big bag of romaine (for $2.98 at Sam’s) lasts completely through my two week grocery period. I LOVE my new tupperware. Got it from Sam’s for $19.98. It’s a 50 piece rubbermaid set with the locking lids! The lids actually lock to the bottom of the container. 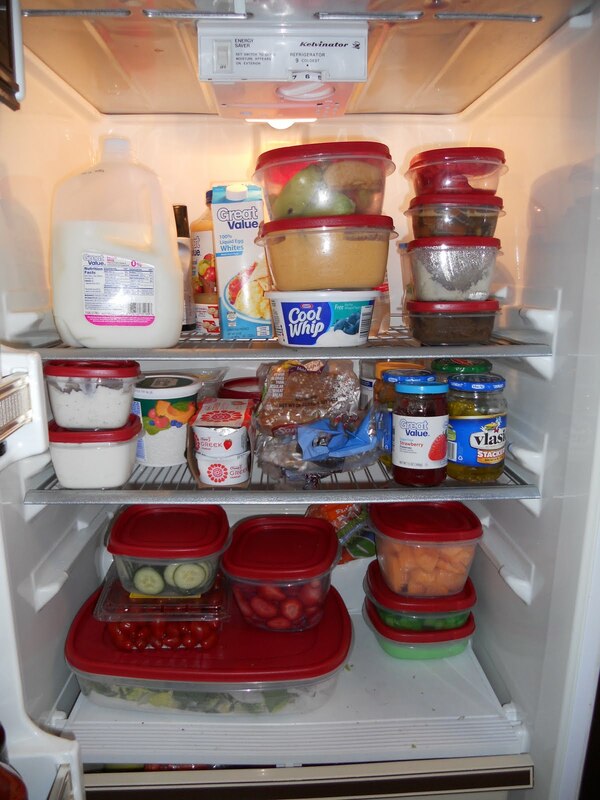 And I leave you with a picture of my OCD organized refrigerator. That’s the big lettuce container guy on the bottom. 1.5 gallon. That I am, to a fault sometimes haha. Pray for my future husband. Lol.